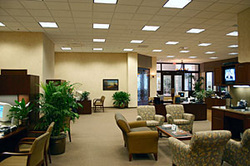 Alsobrook Painting Company serves commerical businesses in the Dallas Metroplex . Owned by Chip Alsobrook since 1985, Alsobrook Painting Company is the go‐to company for property managers, building owners and general contractors who are looking for a fast-paced and high quality job. We will work any time that is convenient for you. Our first goal is to satisfy customers. If you have any questions please contact Chip Alsobrook from the Contact page.